The search function in email these days is pretty good. Most of one’s slack in email organization can be carried by the search tool. Sometimes your email searches can pull up really OLD stuff along with whatever you were trying to find. 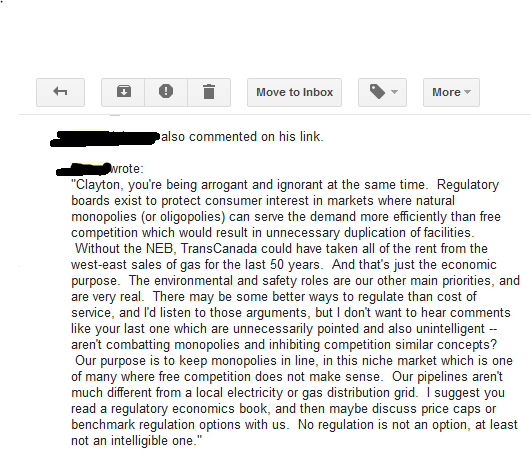 Like an interesting exchange with a bureaucrat from the National Energy Board. Fun! The exchange occurred on Facebook in 2010. It began when I said something to the effect of, “Bureaucrats are bad forecasters; almost no one cares about their predictions; and the NEB should be abolished.” That might have been considered rude, because I said it to a NEB bureaucrat with whom I went to high school! We exchanged a few arguments, and the bureaucrat was clearly outmatched, seeing his economic ignorance exposed at every turn. He ragequit the debate, then deleted the corresponding page to preserve whatever remained of his crumbling credibility. Because the page was deleted, I cannot get Facebook screenshots or links. I can, however, take screenshots of email notifications I received from Facebook on the subject. These notifications contain the NEB bureaucrat’s replies in full. Unfortunately, this means we cannot produce my replies, which were pretty good from what I can remember. We can infer some details about my replies from the bureaucrat’s own comments. So what I will proceed to do is use some of the bureaucrat’s quotes to reveal why his creed is comprised of pure economic ignorance. In doing so, I am sure I will rely on the same arguments I used before, but I am mainly going to provide commentary rather than systematic arguments. Most of what the bureaucrat says is so absurd it refutes itself. We will see how bureaucrats must rationalize their pernicious role in the economy. We will also be frightened by the reality that faulty economics guides government regulation. I will be courteous and take steps to conceal the bureaucrat’s identity. Oh wow. 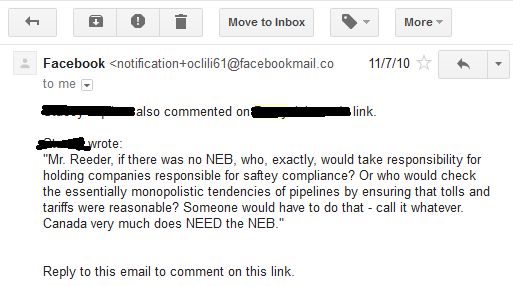 First of all, it is a joke to say that the NEB is an “independent regulator”. Although it is not admittedly clear what that even means. The NEB was created by the government of Canada to function as a cartelization device. There isn’t even a question. Once upon a time, Western Canada’s independent oil producers wanted to build a pipeline to the East. Big international oil producers, who had far more political clout, preferred an arrangement whereby the east imported oil to be refined in Montreal, and Alberta oil would be exported to the US. How could this ever be settled? The government did the only thing that could be done — it set up a commission, which later went on to create the NEB. The conclusion regarding the pipeline was determined in advance. Therefore, the Royal Commission on Energy was stacked with people favorable to those who wanted to create political advantages for some of their friends — including the chief of the commission, Henry Borden. He was head of a utility company who had agreeably helped the government run various different wartime central planning boards during WW2. Other members of the commission were knaves such as George Edwin Britnell, another central planner who’d honed his price setting abilities at the Wartime Prices and Trade Board, and Robert D Howland, a longtime bureaucrat who was fundamentally dedicated to government intervention. The most influential witness heard by the Commission wasn’t even a Canadian guy. It was Walter J Levey, a consultant from Wall Street who represented international oil businesses. This guy too loved central planning. He was head of the petroleum division of the Marshall Plan! The NEB was never “independent”. It’s been purely political from Day 1. Central planning has always been its purpose. Any “independence” is a fantasy. The NEB extracts “fees” from the industry it regulates. If these are involuntary, they are taxes. If they are voluntary, that too is worrisome because it conflicts with the idea of an impartial regulator. Not only that, but the agency doesn’t take enough from the energy industry to cover all its costs anyway, so yes, the taxpayer at large is fundamentally on the hook for this “independent” agency. Note how the comment reveals how the bureaucrat is unsure of the value of the NEB’s market forecasts. He assumes it must be useful and important because the local Calgary news reported about it. Local Calgary news does not report — it parrots government pabulum and offers wildly inaccurate weather predictions. They are desperate for stories, and will therefore cover meaningless reports issued by government agencies that no one cares about. And believe me, the viewers don’t care — if they are the type of people who get their energy market predictions from the local news, then they don’t really care about energy market predictions. “Hi, futures broker? Please sell the March oil contract at market — because of what I saw on Calgary local news!” Nothing like that has never happened in the history of human existence. Now things start to get really exciting. A friend of the bureaucrat joins the discussion. She breathlessly demands how anyone could think the NEB should be abolished. On the issue of safety, we must point out that everything could be done more safely than it is currently done. All safety decisions at the margin. The question is, who decides what is the “right” amount of safety? There are only two options: the market can freely decide, or government can impose a safety standard. In the market, the price for “less safe” work will be bid up relative to “more safe” work. Hence the concept of “danger pay”. That’s why all Canadian lumberjacks have so much money. Tort law and contract law can deal with situations in which market chosen safety rules are violated. Conversely, governments determine safety standards through political decision-making. They are imposed on firms with the power of guns and badges. Often, safety standards are determined by captured regulators. The largest, most powerful firms lobby for expensive safety standards that impair their smaller competitors. Furthermore, imposing standards reduces innovation, because resources will be shifted away from non-standard safety measures. And who would check “essentially monopolistic” tendencies of pipelines? Who indeed? The market would normally do this. Monopolies only arise where competition is restricted by law. It is not a monopoly if I am the only guy with a pipeline in some area, so long as there is free entry to compete with my pipeline. But instead, the NEB exists to restrict competition, as one can see from its formation and continued operations. It doesn’t “check” the monopolies, but rather enforces them. The bureaucrat says so in his next comment. So it is foolish to say that without the agency which establishes the “essentially monopolistic” tendencies of the industry in question, no one would check these supposed tendencies. First, I am always amused by how it is me, saying “let the market work,” who is arrogant. The bureaucrats who think they can manage something as complicated as energy markets are not arrogant at all. That’s rather modest. Because it can be done, as written in the regulatory economics textbook. Who is to say what “duplication of facilities” is unnecessary? The bureaucrats? How do they know? They can’t know. But the market can determine whether a facility should be produced, because it involves people using their property and responding to prices. The bureaucrat’s attitude here smacks of simplistic Marxists who decry capitalism for giving us us too many brands of toilet paper and deodorant. Unnecessary production, they say. Because they know what is necessary? Right, and there is a herd of prancing unicorns that lives in my backyard. One who grasps economic law comes to the realization that there is no “right” or “wrong” numbers of firms in a field of production. The market is constantly adjusting, and allocates resources accordingly when more competition is needed (rate of return is too high) and when there is less competition needed (rate of return is too low). The reader should take special notice of how this bureaucrat — who assures us he is a champion of consumer interests — offers an argument that is ridiculously convenient for the monopolies and oligopolies themselves. “Yes, free competition is good, but not in this situation — i.e. the situation in which competition would threaten my own profits, which are determined on a cost-plus basis. It’s a natural monopoly, so competition just can’t be allowed!” Anyone intelligent can see what is going on here — unless they have a degree in Economics. The bureaucrat needs to have it pointed out that there are no “natural monopolies”. There are only monopolies and monopolistic privileges created by restriction of competition. And this only arises through government interference. It is not a monopolistic advantage for one firm to be bigger than another. He cites TransCanada, which supposedly couldn’t benefit from its monopolistic privileges (provided by government) because it was regulated (by the government). What a mess. Without restrictions to competition, it would have literally been impossible for TransCanada to do what the NEB claims it prevented. The pipeline business overall would have been much stronger. This follows the classic pattern of intervention. Government intervention introduces a problem (monopoly prices). People complain about it. The government does not eliminate its previous intervention, but instead responds with more intervention (regulation of prices) to “solve” the problem it created. This is just like how we are supposed to believe governments and central banks do great jobs regulating their financial systems. Like the US government and the Fed must be real heroes, regulating the economy and looking out for the national interest rather than some other interest. Because that’s what it says in the Introductory Macroeconomics textbook. And “cost of service”. Yuck. That’s just the best way to regulate, he says. Dear God. Are we going 150 years backwards in economic science here? To say that anything, anything at all, should be priced because of what it “costs” is to deny the subjective theory of value as applied to economic goods. Prices determine costs — not the other way around! We’ve known this since the 1870s. That’s what the Marginalist Revolution was. Yet bureaucrats prefer unscientific nonsense if it will justify their existence. Oh no. He did not bring up Chicago. Yes, he did! Well this is the end for Mr Bureaucrat. He is absolutely clueless. Before regulation replaced market competition in Chicago, there were FORTY-FIVE electric light companies. Gas prices had fallen 50 percent. 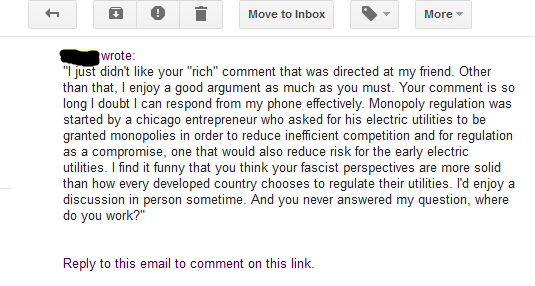 The Chicago “entrepreneur” referred to by the NEB bureaucrat did not like all the competition. Instead of fighting it out in the marketplace, he lobbied local and state regulators to grant him monopoly privileges. Like our bureaucrat friend says, the Chicago utility owner wanted to reduce his risk. He wanted to protect his profits. He didn’t want competition raining on his parade. Great for him and his company. Great for bureaucrats with all their new regulatory jobs. Bad for everyone else! Oh, but one might say: “If there is too much competition it will be impossible to get ‘fair’ return!” Apparently the bureaucrats and those benefiting from the monopoly know what a ‘fair’ return is, but a firm that wishes to risk its capital by competing in a “natural” monopoly doesn’t? Give me a break. A quick tangent: The fascist reference is pretty hilarious. The guy who opposed to monopolies propped up by state regulators is the fascist. Not the bureaucrat who wants to run the economy his way. Not the firms who capture regulators to preserve their monopolistic advantages. He finds it incredulous that I could regard the consensus about utility regulation to be totally wrong. All the countries do it like this, so they must be right, and I must be wrong! Again, there is no reason to think that just because it is currently done one way, that way must be good. Again, look at the world financial system. We are in the midst of a global economic catastrophe because that consensus is horribly, profoundly wrong. Mainstream economics, the very stuff the NEB bureaucrat is depending on, has totally failed us. Even Mervyn King said the financial system is a joke, regardless (or because of) of how closely it follows the textbook prescription. If it’s true in the case of financial regulation, why not in the case of utility regulation? We can apply the same economic principles to public utilities as those we use to determine the financial system is bad, and we are inexorably bound to come to an anti-interventionist position on the issue. What is so inconceivable about thinking mainstream economics has monopoly theory completely screwed up, with its bogus, fantastic models of perfect competition held up as the standard to compare real economic activity? I’m not sure why he cared about my job so much. Maybe because he was trying to network his way out of the soul-sucking bureaucracy, despite his claims of how awesome the NEB is. Or perhaps he wanted to put me in some category of people with allegedly less credibility than him, as if that were possible. My cat knows more about economics than this guy. If I remember correctly, I told him I worked at McDonalds and was an expert at making Big Mac Combos, so that it would be even more embarrassing for him to be out-matched on an economic debate. There were a few other less substantive comments exchanged after this, but the damage had been done. The NEB bureaucrat deleted the page with this discussion and then drowned in an ocean of tears. Bank of Canada Governor and ex-Goldman bankster Mark Carney was selected to become the next Governor of the Bank of England. He will now be overseeing a central bank with nearly ten times the assets of the Bank of Canada. That is a big promotion in the world of central planners! Carney will now be able to create even larger disturbances in economic systems. Truly, the worst rise to the top. Good riddance, I say. Not that I expect him to be replaced with anyone much better. But there is always a chance. Carney, who holds an economics degree from Harvard and a doctorate from Oxford University, swaps oversight of an economy which bounced back from the global recession without witnessing a single bank bailout for one which slipped back into recession in the second quarter and required multiple bank rescues. Carney … swaps oversight of an economy which bounced back from the global recession without witnessing a single bank bailout for one which slipped back into recession in the second quarter and required multiple bank rescues. Excuse me? The banks that pushed for Carney to be their man in England have surely put the shucks on the rubes. Of all the deleterious myths that persist about the Canadian financial system, none are more harmful or obnoxious than the bogus story that its banks never needed and/or never got a bailout. Anyone who says this is simply lying or has no idea what they are talking about. Those are the only real possibilities. We have covered this at CMR previously, but let us quickly review. The mainstream news doesn’t even try to deny it anymore. The Canadian banks got a bailout. Now they simply try to play down the significance of it. Even though it is was much bigger than anyone was led to believe. So is this “no bailouts in Canada” proposition challenged by anyone in the UK? Carney is being sold on the pretense that there were no bailouts? So it would seem one is more likely to see bank bailouts with Carney, rather than less. That is precisely why the UK banking cartel wants Carney in this position. Yet that is not the only reason citizens of the UK should worry. Mark Carney is not only a believer in bailouts — he is a believer in Keynesianism and mercantilism. This means nothing more than this: he sees a connection between depreciating the currency and growing the economy. This he shares with nearly all central bankers (except, perhaps, those in Singapore): he regards a strong currency as harmful to “the nation”. Because when he talks about “the nation,” he is not talking about the consumers (i.e. everyone) who use their stronger currency to buy and invest in more goods. For men such as Carney, “the nation” instead refers to politically-connected export industries that are benefited by making it cheaper for foreigners to buy their stuff. That being the case, Carney will tend to increase the money supply by adding assets to the central bank’s balance sheet whenever he thinks it’s a good idea. But this means prices must rise and debts will deepen. Britain already has big problems in these areas. This should be the last thing someone in the UK should desire. The British pound has plummeted in value the last five years against stronger currencies like the yen. Here in Canada, it seems Carney’s manipulations have been obscured by strong demand for Canadian commodities, yet with the slowdown in Asia, Europe, and soon the US, I doubt this will persist. The Bank of Canada has been growing its balance sheet for nearly two years now, since offloading some of its emergency acquisitions during the financial crisis. Also, it should be known that Carney likes to troll citizens whose currency he manages by blaming them for behavior that is strongly encouraged by his own central bank policies. What a jerk. I am happy to see Carney go. While I am happy he no longer oversees the Canadian dollar, I am apprehensive about who his replacement will be. Most of all, I must also bemoan the lack of justice. Carney should be serving a prison sentence for counterfeiting, rather than getting $1 million a year to manipulate huge economies. Things are a lot different these days than they were when Canada’s postal monopoly went on strike 14 years ago. The Internet dominates interpersonal communication nowadays — a lot of people wouldn’t even notice Canada Post being on strike these days, other than the fact that they’d have less junk in their mail box. Canada Post has offered to increase new employee starting salaries to $19 an hour, from the previous $18 rate, in a workforce where hourly wages top out at $26 an hour. Canada Post counters that it needs to address labour costs, noting letter-mail business has fallen more than 17% since 2006 due to digital communications — the Internet is chipping away at its business. Question — why do letter carriers need to be paid $18 an hour at all??? Why does their maximum wage need to be $26? This is a job that could be done by teenagers for $10 an hour. These teenagers would, at least, probably be able to put the right mail in the right mailbox, unlike your average lazy, contemptuous, and bitter Canada Post worker. Why is it considered a right to get subsidized mail delivery to your house? Why shouldn’t you have to pay the appropriate market price? Shouldn’t you have to pay more for mail when you live in Nunuvut than if you live in Toronto? After all, “mail delivery in the big city” is a very different service than “mail delivery to the desolate Canadian tundra with a population of 17 people”! Why should mail delivery to the middle-of-nowhere be subsidized by people who don’t use Canada Post for anything? This is not moral, and it is not economically efficient! The whole postal monopoly system is a disgrace. Canada should use the opportunity of this postal strike to abolish Canada Post, which is a complete waste of all resources allocated to it. Then competition should be legalized and the free market can provide real mail service with true market prices. Here is a 3-step solution to the Canada Post strike. Only these options are consistent with good economics, good ethics, and not being a complete idiot. 1) Fire everyone who works for Canada Post at the moment. That way they can get jobs that actually contribute to the economy. 2) Remove all legal restrictions preventing private firms from providing mail service. 3) Abolish all regulations on courier services so that such services can be more affordable and more readily available to all consumers. ONLY if this solution is adhered to, will Canada have good postal service. Giving Canada Post’s union ANYTHING, be it more vacation hours, better wages, “better working conditions,” is a complete waste, and will produce more of the same garbage we expect from Canada Post. We need less Canada Post, not more.